When it hurts to live, it helps to talk. For more information on Jeffrey and Kevin Graham Support Services, or to seek help through the program, go to www.pikespeaksuicideprevention.org or call 719 573-7447. The Pikes Peak region is getting a significant boost in the fight against suicide, thanks to a couple that has dedicated itself to the cause after one son took his life in 2003 and another died in combat about seven months later. Retired Maj. Gen. Mark Graham, commander of Fort Carson from 2007 to 2009, and his wife, Carol, were back in Colorado Springs Thursday from their home near Fayetteville, N.C., to launch Jeffrey and Kevin Graham Support Services, which will operate under the Suicide Prevention Partnership of the Pikes Peak Region umbrella. The program has three key elements: a workbook-based segment for anyone who has contemplated or attempted suicide; 12-step support groups modeled after Alcoholics Anonymous; and a group for family and friends to teach them about mental illness and depression, intervention and other aspects of helping a loved one struggling with suicidal thoughts. “We’re hoping this can become a national model,” said Janet Karnes, executive director of the Suicide Prevention Partnership. Colorado historically ranks among the top 10 states in the U.S. in the number of completed suicides, and although El Paso County’s rate isn’t the highest in the state, well over 100 residents take their lives each year. And that’s only a small chapter in a much bigger story, Karnes said. For every completed suicide attempt, there are numerous attempts: 25, by many accounts, she said, and up to 200 among young adults, according to a 2009 report from the U.S. Centers for Disease Control and Prevention. And someone who has attempted suicide before is likely to try again. 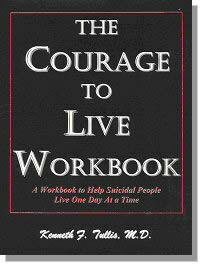 The heart of the program for people who have attempted or contemplated suicide is a workbook called “Courage to Live,” written by Tennessee psychiatrist Kenneth F. Tullis, who tried to take his life seven times. The book, which includes writing and reading exercises, helped Carol Graham deal with her own suicidal thoughts after Kevin took his life at age 21 and Jeffrey was killed in combat in Iraq. Another workbook, “Words Can Work,” will be used to help family and friends learn more about depression and suicide. The Grahams met Karnes when they lived in Colorado Springs, and they’d been funding the Suicide Prevention Partnership’s crisis hotline, which was named after their sons. When they offered to continue funding the hotline, Karnes told them her nonprofit had a bigger need for an ongoing peer-support program that could augment any therapy or other help that attempters and their families receive. Carol Graham knows that families need the support. After the death of her “tender-hearted” son Kevin, she felt guilt and shame that she hadn’t done enough to make sure he got help for his depression. With Jeffrey’s death, she was celebrated as the mother of a hero, because he died in the course of saving his platoon. But that little boost in recognition gave them the impetus to tackle suicide, she said, and they’ve set up suicide prevention on college campuses and taken on speaking engagements throughout the U.S. Coincidentally, the launch of the new program in Colorado Springs took place on what would have been Kevin’s 31st birthday. “It’s a real blessing for us that something like this can be launched on Nov. 15,” she said.